This year, strengthen the core of your life and faith like never before. Beloved Super Bowl-winning coach Tony Dungy is known for his truly uncommon character--as a coach, a dad, and a mentor. Yet it didn't happen overnight. He learned that the path to significance and ultimate success starts with a challenge that we can all take: to discover what God has in store for you by spending time with Him every day. 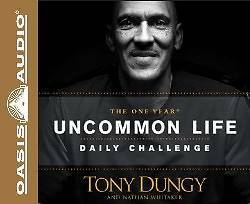 In The One Year Uncommon Life Daily Challenge, Tony Dungy shares 365 Scripture readings and reflections on how to live an "uncommon life" of integrity, honor your family and friends, create a life of real impact, and connect with God in a deep way. If you're truly uncommon, then you're dedicated to being more than what the world is calling you to be. You're ready to develop the beliefs, values, integrity, and faithfulness that lead to true victory in life. So step up to the challenge to spend time with God--and dare to be uncommon every day.